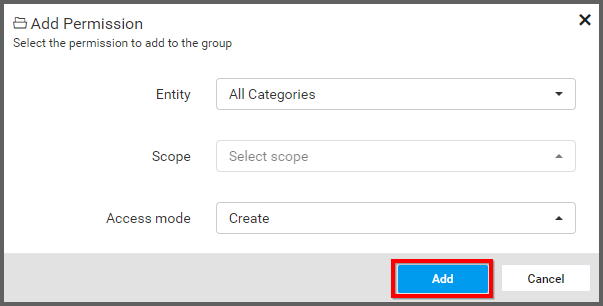 This section explains the access modes, entities & scopes and how to share the permissions for the users and groups. Permissions can only be managed by the users belonging to the System administrator group. Permission can be directly added to both users and groups. Permissions are classified in the following structure. Read – Provides read permission for the chosen entity. Read and Write – Provides read and write permission for the chosen entity. Read, Write and Delete – Provides read, write and delete permission for the chosen entity. Create – Provides permission to create the chosen entity. All Dashboards – Provides permission to access all dashboards with the chosen access mode. Dashboards in Category – Provides permission to access dashboards in a specific category with chosen access mode. Specific Dashboard – Provides permission to access a specific dashboard with the chosen access mode. All Data Sources – Provides permission to access all data sources with the chosen access mode. Specific Data Source – Provides permission to access a specific data source with the chosen access mode. All Categories – Provides permission to access all categories with the chosen access mode. Specific Category – Provides permission to access a specific category with the chosen access mode. All Schedules – Provides permission to access all schedules with the chosen access mode. Specific Schedule – Provides permission to access a specific schedule with the chosen access mode. Scopes can be chosen for the below entities only. Other entities do not require to specify the scope. Dashboards in Category – A specific category has to be chosen to provide access to the dashboards in that category. Specific Dashboard – A specific dashboard has to be chosen to provide access to it. Specific Data Source – A specific data source has to be chosen to provide access to it. Specific Category – A specific category has to be chosen to provide access to it. Specific Schedule – A specific schedule has to be chosen to provide access to it. Create access can only have the scopes, All Dashboards, Dashboards in Category, All Data Sources, All Schedules and All Categories. Sharing Permissions page for the user can be accessed from any one of the following places. Here you will find both the permissions assigned directly to the user and the permissions that the user got inherited from the groups assigned with. Click on Add Permission to add permissions to the user. Add Permission dialog box is shown below. Select the scope if the entity is not All item type. Click on Add to add the framed permission to the user. Sharing Permissions page for the group can be accessed from any one of the following places. Here you will find the permissions assigned directly to the group. Please refer the below screenshot for the Sharing Permissions for the user page. Click on Add Permission to add permissions to the group. Add Permission dialog box is shown below. Click on Add to add the framed permission to the group.